We really enjoyed David Lebovitz’s cream cheese brownies recipe and I will definitely make them again, but I had to test another idea. I wanted something seasonal, so instead of plain cheesecake swirled through brownies, I buried pumpkin cheesecake in the brownies. The pumpkin cheesecake brownies are still marbled on top, but because there’s almost a full bite of pumpkin cheesecake in every brownies, I decided to call them “layered” instead of “marbled”. These were so good! They definitely taste better and slice cleaner on day 2, but you can cut into them after a few hours in the refrigerator. Also, you’ll notice that the batter and filling take up an entire 9 inch pan going all the way to the top. The brownies are very tall. 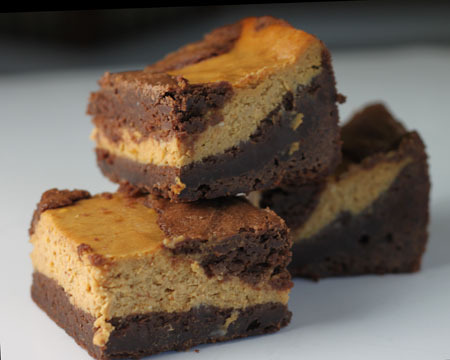 Layered Pumpkin Cheesecake Brownies for Halloween. Preheat oven to 350 degrees F. Line a 9 inch square pan with foil and spray foil with cooking spray. Make the filling first. Beat the cream cheese and both sugars together with a mixer, then reduce speed and beat in the pumpkin, egg, vanilla and pumpkin pie spice. Stir in the flour. Set aside. In a second bowl, beat the butter, salt and sugar until creamy. Beat in the eggs and vanilla. Stir in the melted chocolate chips then stir in the flour. Pour all but about 3/4 cup of the chocolate mixture into the pan. Spoon the pumpkin mixture evenly over the brownies layer. 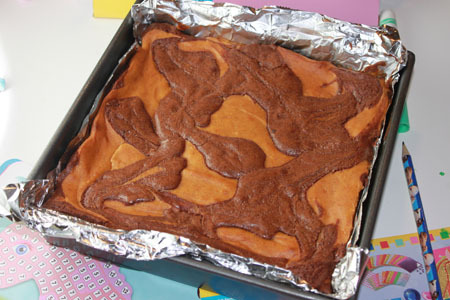 Drop reserved brownie batter over pumpkin to give the brownies a splotched, marbled look. Bake on center rack at 350 for 45-50 minutes or until brownies test done. That is, when a skewer inserted comes out clean. Let cool for about two hours at room temperature and then chill for a few hours or overnight (the longer the chill, the better). Lift from pan and cut into 16 large squares. I just had to tell you this–I made these brownies yesterday, and messed up almost every step, yet they still turned out delicious! I used Trader Joe’s truffle brownie mix because I’m visiting my brother and he, uh, doesn’t have much to bake with, and tried to do the cheesecake according to the recipe. I accidentally dumped in way, way too much pumpkin pie spice, and I baked it in an 8×8, and the cream cheese wasn’t very soft when I creamed it with the sugar. Refrigerating them is absolutely the key to these brownies! They were so good chilled. Thanks for the great recipe that not even I can ruin! Made these the other night and brought to work – EVERYONE loved them! For those who don’t have a 9″ square pan, the following common pan sizes can be substituted with little difficulty. I just made these in a 7×11, and they came out great (the batter did rise past the top of the pan, but nothing spilled). I used a Hershey’s Special Dark chocolate bar and made up the rest with 90% cocoa bittersweet chocolate, rather than the chips (it’s all I had lying around). Anna, I am a new baker, new to your blog, and new to comment here. I just have to say, this brownie recipe is perfection. I recently moved to a small studio apartment and bought a 9″square pan today specifically to make this recipe. What I did forget were mixing bowls, so I had to make do with the two pots I own. I don’t own bowls, yet alone a hand mixer and got quite a workout with this recipe. Despite my poorly equipped kitchen, these turned out exactly like the picture. My boyfriend assured me they would be a hit this Sunday when we celebrate Thanksgiving with his family. He waited a whole 45 minutes before cutting into them. They were still heavenly. I made a double recipe and put it in a 10 X 15 Lasagne Pan – deeper than the typical 10 X 15 jelly roll. It was perfect! Like Julie, I had to cook it about 65 minutes. These were great! Made them last night in a double batch and in 8 inch pans. Ended up baking for 65 minutes, at which my skewer test still wasn’t clean but after a good long chill they were awesome. I am getting text messages left and right from people at work and my boyfriend is becoming the most popular guy at his work. Thanks for posting the recipe! Found you through tastespotting. Debbie, I didn’t freeze this batch, but I am almost positive they’ll freeze well. You could freeze a cut brownie to test, but since cheesecake freezes well and brownies freeze well, I don’t see why these wouldn’t. These sound wonderful. Do you have any idea about how well they would freeze? I love things I can do ahead and have in the freezer to pull out as needed. Thanks for testing with brownie mix! It’s good to know that particular shortcut works. I made these this weekend and they were a HUGE hit! I had multiple requests to send the recipe to friends. I did a slight variation and used the boxed Ghiradelli brownie mix instead of making the brownie part from scratch. I also used RF cream cheese instead. I baked the brownies for approx 48 min and they were perfect! Definitely worth the wait while the refrigerate though. My boyfriend couldn’t refrain ourselves and tried them while still warm. They were good but not nearly as delicious as when they were refrigerated. Wow, thank you so much for doing this for me! I really appreciate it! The party is in a couple weeks so I will let you know how this came out. Thanks again and happy baking! Since these are made in a 9 inch pan, a double batch would typically need the surface area of a 15×10 inch pan as opposed to a 13×9 inch. However, most American 15×10 inch pans are not tall enough so you wouldn’t have the right volume. You could go ahead and double the recipe for a 13×9 inch pan, but you will probably have a good deal of leftover batter. That being said, I don’t think a double batch will take that much longer to bake. I’d check at 45 or 50 minutes. Another idea, you could make 1 1/3 the recipe. I took the liberty of adjusting the measures for you below. I think this would give you just the right amount for a 13×9 inch pan. Preheat oven to 350 degrees F. Line a 13×9 inch square pan with foil and spray foil with cooking spray. In a second bowl, beat the butter, salt and sugar until creamy. Beat in the eggs and vanilla. Stir in the melted chocolate chips then stir in the flour. Pour all but about 1 1/2 cups (this is a guestimate) of the chocolate mixture into the pan. I would like to make these for a Fall party. I am thinking about doubling the recipe and baking it in a 13 x 9 dish. What would you recommend for the baking time? Any additional advice for doubling this recipe is greatly appreciated! Krista, it sounds like you did use an 8 inch. With a 9 inch, the brownies should come up pretty high, but not all the way to the top. I hope you like them! It’s hard waiting for them to chill. i baked these this afternoon – i’m dying waiting for them to chill… i had so much batter that i had to make a little mini one in a 4oz ramekin! my pan was filled to the brim!!! perhaps its an 8 inch and not a 9… do you think these would work in a 9X13 with a shorter baking time? Despite my error these turned out really great for me. Everyone I shared them with loved them! Thanks so much for the feedback! It really helps to get a second opinion on new recipes like this one. Also, thanks for specifying the pan sizes since that will come in handy for those needing to make larger batches. Thanks again for trying the recipe and noting your changes. Anna!!! I had to come back and tell you…GREAT GOOGLY MOOGLY, these Brownies are some of the most AWESOMEST, DELICIOUS Brownies I have ever made! I think my customers are going to swoon when they have that first bite. I just had a sliver of an edge, and it was so yummy! I love pumpkin! These brownies are a must-try. Have you tried the Trader Joe’s pumpkin bread mix? I mix in some canned pumpkin, and it is just delicious! So. I posted your photo on my FB, and told my friends/customers that I was making these tomorrow, and already have orders for FOUR pans of them! Can’t wait to actually make them and TASTE them, lol. Thank you SO much for wonderful recipes, I’ve been a fan for a couple of years now, and you have never let me down. These brownies look delightful Anna! Remember the Chocolate and Pumpkin Bundt Cake you made? I will have to try and locate that recipe. Fall is a great time for ANYTHING pumpkin! These look amazing! Would love one with my cup of coffee now. Yay, another cream cheese recipe. The cream cheese filling and brownie go sooo well together. I know I wouldn’t be able to resist eating this if I made it. Thanks for sharing. Oh Anna…this is right up my alley. There is a pumpkin shortage here. I make a wonderful pumpkin chocolate chip bread and haven’t been able to find any pumpkin. I did find out who has it though, so I will be making it as soon as I can get some! Thanks for the comments! I can’t wait to hear what you all think. Darlia, I emailed you some of my favorite bake sale items. Good luck! Yum!!! I have chocolate. I have cream cheese. I have a can of pumpkin. Maybe later today or for sure tomorrow. Fund raiser for a boyscout troop. Friday, sat, sunday. I’m baking for them and donating all the baked goods, so they can have $$ to go to Camp Orr next year. Several of these families will be working the booth. I’m the baker, though. Tx, will make pumpkin brownies. Delish looking. These look wonderful. Will definitely be making them. I love love love pumpkin and chocolate and I think I have made every pumpkin/chocolate recipe you have ever posted. But I’m holding off on pumpkin for now, in denial about fall which is easy to do since we are finally having some summer weather in Northern California. But I predict that I’ll be making these before October is over! Adding pumpkin is a great idea. to the cheesecake brownie concept. Oooh holy moly. These look epic! That’s it, I’m breaking out the cans of pumpkin in my pantry. After seeing these and some pumpkin whoopie pies over at Joe’s blog, I’m just gonna have to. These look brilliant! Must try, thanks! Those look awesome! I love fall baking! oh my! i have to try these… they look fantastic! Oh yes, these are my kind of brownie! I love cream cheese and love pumpkin! Great! Lovely recipe! Thank god I can still see your site or I’ll die.